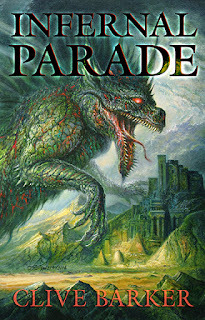 This astonishing novella, Infernal Parade, perfectly encapsulates Barker’s unique abilities. Like the earlier Tortured Souls, an account of bizarre–and agonizing–transformations, Infernal Parade is tightly focused, intensely imagined, and utterly unlike anything else you will ever read. It begins with the tale of a convicted criminal, Tom Requiem, who returns from the brink of death to restore both fear and a touch of awe to a complacent world. Tom becomes the leader of the eponymous “parade,” which ranges from the familiar precincts of North Dakota to the mythical city of Karantica. Golems, vengeful humans both living and dead, and assorted impossible creatures parade across these pages. The result is a series of highly compressed, interrelated narratives that are memorable, disturbing, and impossible to set aside. I could very quickly go broke collecting Cemetery Dance editions, but a new Clive Barker novella, complete with artwork by Bob Eggleton? Damn, this looks awesome. That one looks exciting! Hope you enjoy it once you get to read it! That sounds really good, and I love that cover! Nice pick! I've never read anything by Clive Barker. Is that sad? Great pick! I saw this the other day and it's pretty cool! One of those rare books that you need to snap up quickly if you really want a copy. A little touch of Nightbreed perhaps? Definitely a good collector's edition for any Clive Barker fan. That's is a serious golem/dragon/creature on the cover!